Precious transparent decorative finish, enriched by a cascade of multicolored pigments that create spectacular play of light and reflections. The slightly rough texture, pleasant to the touch, lends itself to the realization of various decorative effects to enhance both classic and contemporary design environments. Easy and quick to use, LUNANUOVA enables to decorate with the maximum simplicity and to develop endless creative ideas according to the base coat chosen and the desired color. 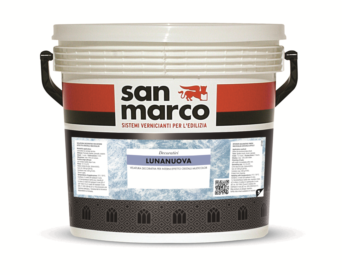 – LUNANUOVA can be applied on: BRAVOCASA, UNIMARC SMALTO MURALE opaco, RILIEVO, FORMA, MARCOPOLO and CADORO.